"There is no Tsukihime Anime." Ah yes, those infamous words. Before all of you say anything, I DID finish the visual novel and I HAVE read the manga (well, the first three volumes) and guess what, I STILL enjoyed this anime so sit back, relax and let me tell it like it is. As far as story goes, I don't see what the problem was. Quite honestly, I thought the visual novel was redundant when explaining the differences between a Dead Apostle and a True Ancestor. In the anime, it goes straight to the point and makes easy on the viewers. Dead Apostle is a human turned vampire. True Ancestor is a transcendent race, vampires yes but were never human to begin with. While the plot is still much deeper and complex in the visual novel, don't really undermine the anime's version of it. If you are a huge Tsukihime buff and want to know EVERYTHING about Tsukihime, then you won't like the anime. But if you just want to get in and enjoy a decent anime then won't bore you to death with details, then watch the anime. The art was done well in my opinion. While they could have brushed up a bit better on some characters (Nero and Roa come to mind) in general, the characters look like they are supposed to. In general, the art is not outstanding but is still pretty good. The music, especially the opening, is what made this series. Very nice tunes from start to finish. Having only watched the English version of this show, you will probably recognize the voices right away. Arcuied is voiced by Michelle Ruff (Rukia anyone?) and Shiki is voiced by Steve Staley (who voiced Toshiro Hitsugaya). In short, if you enjoyed the Bleach dub (like I did) then you will like the dub in this series as well (since half the Bleach cast is in here.) Cannot comment on the original voice acting. No doubt the weakest part of the series is the characters. Arcueid comes across as far too clingy to Shiki (she liked Shiki in the visual novel as well but she wasn't hitting on him every other minute), Akiha is well, the same basically, Ciel is meh and Nero and Roa were punked. Which brings me to another point. All of these guys got severely gimped in the anime. Shiki is on his knees having migraines 99 percent of the time, Ciel gets owned every single time she fights, Akiha is no better, Nero is as scary as a house cat (no Soil of Genesis and 999th Beast really blew hard) the list goes on and on. Seriously, the only one doing anything in combat was Arcuied (when she wasn't trying to molest Shiki) and even then she has trouble from time to time. Even so, this show does have its moments. I have to say that episode 7, the amusement park episode, was really funny and awkward and the times between Shiki and Arcuied when they are not hunting vampires is also neat to watch. Overall, the anime is not the visual novel. It is not as good as the visual novel and when compared to the visual novel, it would be considered below average. But I came reviewing the anime and only the anime and found it to be a short yet enjoyable series. So there's a funny little joke that goes around anime communities and it goes along the lines of "There is no Tsukihime anime". I thought it was all in jest when I decided to see what the fuss was about on this show. Sadly though, I too believe there is no Tsukihime anime after watching this monstrosity. Flashback, its 2000..there's a little doujin game called Tsukihime out there that's taking the visual novel world by storm..3 years later JC Staff..a prominent animation studio makes an adaptation of the wildly popular game. However, they either A: Did not play the game or B: Just made this as a kick in the balls to anyone who enjoyed the visual novel. For story, it was pathetic..they took a very strong storyline with an incredible amount of backstory and turned it into a shallow excuse of a story. The whole explanation of the differences in vampires was a major part of the visual novel..yet they put in 30 seconds of quick explanation and that's it. This is frequent throughout the anime..they take ideas from the novel throw them in quickly and forget about them. On top of insulting the vivid and excellent storyline of Arcueid's route they add other nonsense such as a whole episode dedicated to a theme park..they must have really wanted to piss off fans with that since one could easily make a 24 episode series out of the route yet they add a filler episode into a 12 episode anime. Among that they completely twist character roles, their personalities and their part in the story. And to top it off..they completely destroy the end to the story and give no explanation at all. They just leave it as an open ending of sorts after completing a route with definite closure. The story gets a 1...it's a monstrosity that mocks the visual novel. As for art..it's excellent, for 2003 of course. They added a good amount of detail and the characters looked pretty accurate to their visual novel counterparts. It's actually pretty decent looking still even on 2010 standards which is a good thing..yet it's not awe inspiring art like some early anime had. 8 out of 10 for art. The sound in this anime is the only redeeming quality other than the decent art. The soundtrack is incredible and it sounds much better than the visual novel's. They really did a great job on this part and the wide variety of songs were on point and gave a clear message of the scenes. 10/10 for the music since I very rarely hear such a great soundtrack in an anime thats unique like this one. Enjoyment? The only thing I enjoyed was laughing at my computer screen over how terrible this was. There is not much to enjoy in this anime, it's a completely hilarious mockery of the parent story. I spent the whole time picking out the horrible adaptations they did to nearly every part of the story..that was my enjoyment. It gets a 1/10 for enjoyment..I could have watched the Tekken movie 12 times and enjoyed it more than this. Overall, this series gets a 2. The horrible adaptation of the novel is the main cause of this. I can't give it a 1 because the soundtrack is amazing and the art was pretty good for a 2003 anime. If the soundtrack was not an excellent and unique piece of work this would definitely be a 1. I do not suggest watching this show if you have any shred of understanding on what the Tsukihime visual novel is. Even if all you know is that the meme "A cat is fine too" comes from it I would suggest steering clear of this. I honestly wanted to attempt to prove the people wrong when they say "there is no Tsukihime anime" yet now I agree with them. You might be wondering. I gave all the rest of the criteria 10's. But why is the overall a 6? It started a long time ago, when I got word of a highly acclaimed, super popular doujin game called Tsukihime. Although I was never a fan of the 'point &amp; click' type of anime games, this game caught my interest, because of how several rave reviewers were praising this game's depth, plot and amazing characters. So I got it and played it. Boy, did it have all of the aforementioned stuff plus a whole lot more. By the end, I was hooked. And something happened to me after going through Tsukihime that rarely happens; I fell in love with the characters and the story...particularly with Arcueid. It is one of those stories that touch your heart and inspire you to become a different and better person. And change me for the better it did. And several years later, when I heard that TYPE-MOON were releasing an anime adaptation, I became as one might say, a giddy little schoolboy. And when I first saw the teaser trailers, I got even more pumped. It seemed as if the anime was going to be magical. Finally, an adaptation where they were going to get it right...at least that's what I thought so initially. And after finishing the anime for the first time, I was grateful that they made a lot of changes. They did kept the dark tone. And the soundtrack was amazing too. Again, it was dark and low-key. The opening song was particularly of interest. I often find myself repeating the minute-long song over and over again in my iPod. However, much to my relief, they removed all the cheesy gadgets of the plot that were there in the original game. No longer, were there mentions about Marble Phantasm (an attack name in the original game) or any other cheesy vampire jargon like that. I was glad, because those elements made the game like a shonen (and anyone who knows me knows that I hate shonens). So I finished watching the entire anime the first time. I was impressed by how well they kept true to the original story. The 'physical anime' interpretation of the last episode was perhaps the best. It overjoyed me to the point of tears. The way they brought Arcueid to life was also a joy. Her design in my opinion, was also superior to the original's, because here, she looks more mature, beautiful and elegant. I wanted more. Seeing as how there are no sequels (something which I am actually grateful of), I decided to re watch the series again to relive the experience. And here's where things began to go wrong. I began to realized that, although the story was brilliant, that it worked under the assumption that the viewer had played the game before. As a result, the brilliant story wouldn't be as appreciated by someone who hadn't played the game. No wonder there were many reviews that criticized the storyline for being incoherent and leaving a lot of loose ends. I understood the story only because I had played the game. Most people haven't. The story also meanders...a lot. There is a lot of filler segments where everything moves so slowly. Meaningless pauses during conversations also ruin the mood. These pauses would've worked so much better if the camera was shaky, or at least was doing something dynamic to compensate for the lack of action. Perhaps the writers were trying to create a certain ambiance to suit the dark story. Even as someone who appreciates silence as a means of tension, I did not like it. They try to create tension, but there is not enough release to compensate. For instance, in one segment where the main character tries to look for a door to match the key he found earlier, the scene goes on for too long without any dynamics. Two minutes are wasted on one still angle of him going from door to door, looking for one that will match his key. That scene made me sick. Removing certain plot elements which could've actually helped. On one hand, they managed to simplify the story so that all the unnecessary mystic terminology was removed, and that really helped keep the dark tones of the story. However, on the other hand, a subplot involving Hisui and Yumizuka could've seriously added more impact to the story and the ending would've been much more tragic (and subsequently, so much better). Wrapping it up, it seems apparent to me that the biggest mistake of this anime, was whoever the person who was directing this anime. He is no Miyazaki. A lot of his storyboards and camera angles simply were not effective and brought the anime's pacing to the equivalent of a drone. It was evident that he had too much funds to waste. In the beginning, where the plot wandered the most, everything was slow and unorganized. However, according to the news, the studio had run low on money at the end of the series. And coincidentally, that was when the story started to become tighter and focused. The final episode is still the best episode. It was perhaps the one episode I can watch from start to finish without skipping parts. I am sure that if the studio responsible was given less money, the anime would've been much better because the studio would've been much more focused. And, if there were less episodes, who knows that it might have been better. Make no mistake. This is an exceptional anime. It is way superior to a lot of animes that have been released over the years. And as an anime adaptation, it stands out by being superior to the original in many ways. And I will still continue to watch this anime into the future to relive scenes from the game which would normally take hours to do (considering that the game was all text and that I had to spend an hour reading a scene). However, I am disappointed in the creators for not making the anime the masterpiece it should have been, simply because it is not organized. It had the music, the characters, the design and feel. The 10's I gave were technically not for this anime. Since this is not an adaptation, not a original story, these points are actually for the game. It should not have gone wrong. Shame on you Geneon. Lunar Legend Tsukihime is a Supernatural, Romance, Drama about Shiki Tohno; a boy who&rsquo;s said to have been caught in a terrible accident 8 years ago and since then he has been able to see the lines of Death in everything and everyone. One day in the park he kills a lady but then wakes up in his room. Was it all a dream? Maybe or maybe not, because the next day he meets her again. Well this is the starting point to this very short anime and even though it&rsquo;s short the story is surprisingly slow moving. Even though it doesn&rsquo;t seem like it in the very beginning, the show ends up being yet another one about vampires, with some more confusing theories to confuse anyone on the increasingly complex concept of vampires. 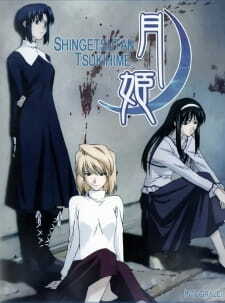 Unlike most show involving vampires, the vampires are the secondary focus to the story with the primary focus being on the 2 main characters Shiki and Arcueid (a vampire). All of those anime fans hoping of plenty of vampire action (Trinity Blood, Hellsing, etc) may be disappointed, as all this show has to offer is a decent surreal story. At least the anime can have anyone, who&rsquo;s captivated by the story, asking for more as minor developments occur throughout the show. Another thing about this anime that will captivate a viewer is the lavish visual, similar to another gorgeous TYPE-MOON anime, &ldquo;Fate/Stay Night&rdquo;. With superb animation, artwork and CG effects; it&rsquo;s obvious to see how much time and effort was put into making this show look good. It&rsquo;s just disappointing to see it wasted on the lack of fluid or any combat, in this anime. The music was superb with a compilation of string instrumentals (violins) that really set the surreal and suspenseful mood. The only problem with the music was the lack of variety as the same tunes are played over and over, to the point where it can remove the mood, helped originally set, later on in the series. Overall this was a great anime that inevitably turned into a romantic drama and with a pretty well written story. The build up to the ending was so superb, with all the pieces finally coming together however the tragic ending failed to leave an impact on me. Even with the superbly lavish animation and intricate story what failed in this anime were the slow moving storyline and especially the stale characters. The characters were nothing special and any anime fan who has seen a couple different anime would notice the character&rsquo;s personalities which are found in the typical high school scenario of anime. Just like the protagonist, Shiki&rsquo;s personality who&rsquo;s similar to Kohta from Elfen Lied (weak, kind-hearted and can&rsquo;t remember something tragic in his past). With that said this is only an anime that serious anime fans can enjoy, those expecting 12 episodes of violence or comedy won&rsquo;t be satisfied with this Suspenseful story of Romance and Drama. Will they ever make a Tsukihime anime?